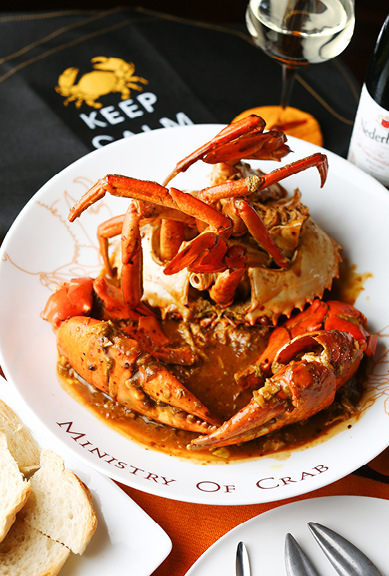 Ministry Of Crab Opens In Mumbai & We Got An Exclusive Pre-Launch Preview! 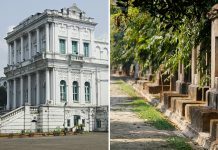 In 2011, celebrity chef Dharshan Munidasa along with Sri Lankan cricketers Mahela Jayawardane and Kumar Sangakkara launched Ministry Of Crab (MOC) in Colombo’s 400-year-old Dutch Hospital. While MOC has done numerous pop-ups all over the world, this is only the third time (MOC is in Philippines and China as well) the restaurant is expanding to a new country. The creative forces behind restaurants such as PizzaExpress and Typhoon Shelter—Mumbai’s Gourmet Investments Pvt. Ltd (GIPL) are instrumental in bringing MOC to India. 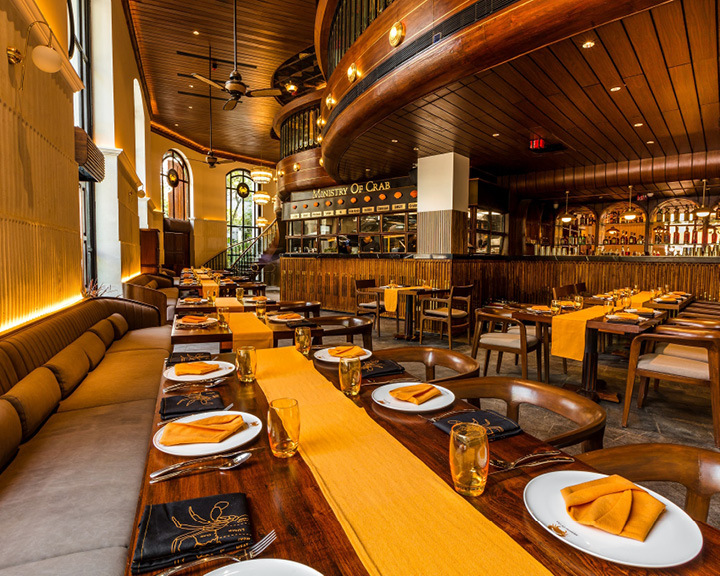 MOC Mumbai is an art deco-inspired restaurant and bar, designed by Ayaz Basrai. During the day, the eatery, with its massive windows, has sunlight beaming in. Conversely, at night, the setting is mysterious and cosy. An old-fashioned spiral staircase with a majestic chandelier welcomes guests to a three-storey space. We loved the old-world charm, high ceilings, art deco furnishings and open kitchen. The basement is a private dinning space, and the top floor features an exquisitely designed bar. The main floor has intimate tables and a giant board highlighting the catch of the day, allowing customers to make their pick. Washed in calm shades of brown, orange and black, the restaurant has a woody tropical vibe. While the food philosophy of MOC Mumbai is the same as the original, some additions have been made to the menu. 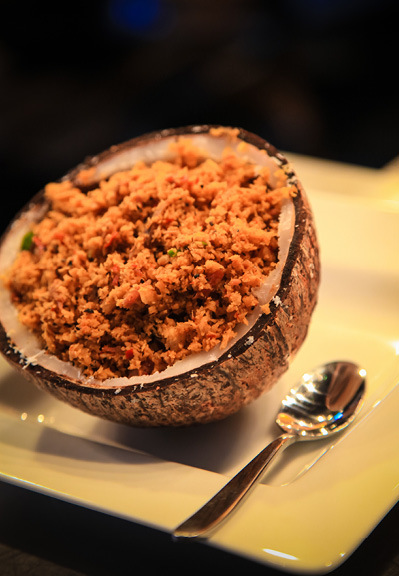 A number of vegetarian dishes have been added and the bar nibbles’ menu has been created, too. Our tasting menu included a combination of MOE classics and Mumbai additions. The classics were the Avocado Crab Salad, Clay Pot Prawn Curry, Pepper Crab and Garlic Chilli Crab, accompanied with Garlic Bread, ‘Kade’ Bread (traditional Sri Lankan wood fired bread), Japanese Rice and Garlic KanKun (Sri Lankan vegetable). The MOE Mumbai additions included Avocado and Tomato Salad, Goan Curry and Wok-tossed Greens. Our favourites were the Clay Pot Prawn Curry and Garlic Chilli Crab. For dessert, we had The Story of Cacao, a bitter chocolate and cacao mousse on a bed of chocolate chili soil. It was surprisingly well balanced and delightful! While we had champagne with our meal, we learnt that the restaurant’s bar is well equipped with an extensive wine and spirits list, along with simple and refreshing cocktails that complement the food. Finally, Chef Dharshan Munidasa concluded, “We are looking forward to working in the Indian market with Indian crabs and the young Indian chefs. 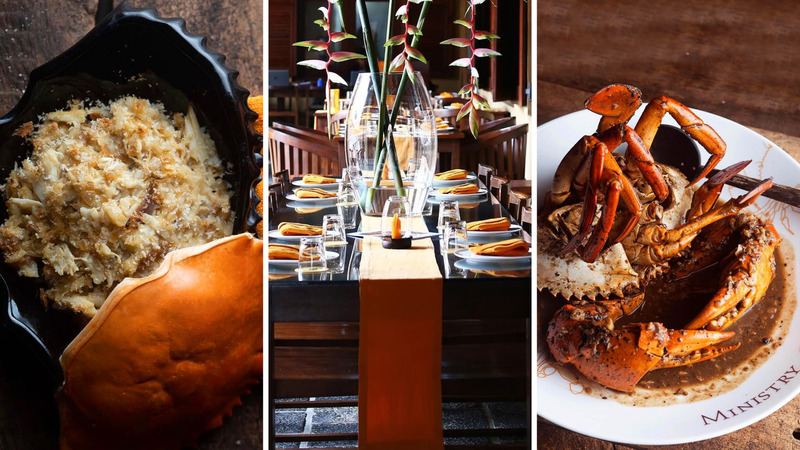 We are happy to have partnered with Gourmet Investments, as they have shared our value system and are committed to bringing the DNA of The Ministry of Crab to give our guests an authentic experience.” With its authentic Sri Lankan flavours, buzzing ambiance and luxurious interiors, Ministry Of Crab India is finally ashore!